I’ve been on a movie going binge lately and went to see La Mome, the new film bio about Edith Piaf. I’ve been anxiously waiting to see this film and advanced word/hype has been very good. To say the film met all my expectations would be putting it mildly. I can’t praise the performance of Marion Cotillard as Piaf enough. She is one of those rare actors that lights up the screen in every frame she is in. Her big brown sad eyes, full lips and pale milk white skin give her a vulnerability that goes to right to your heart. Every scene she is in is a revelation and even the smallest moments are deeply revealing, as you feel and live everything she is experiencing. I hope she is not forgotten at Oscar time next year, as it would be down right criminal if she didn’t win. The only down side is that she may have set the bar too high and anything she does in the future might be a step down. I also have to praise the hair, makeup, and costumes for seamlessly having Piaf go from an 18-year-old soigné to a 48-year-old decrepit woman ravaged by cancer, without a false moment or too much prosthetics and overdone makeup. The story leaps all over the place going from her difficult childhood in a an brothel being raised by caring prostitutes that is a little too romanticized, to her dying in a hospice, to breaking down on a concert stage in New York. The clever editing saves the film from being a standard bio pic. The metamorphosis of Marion Cotillard as Piaf from insecure gamin, to a sultry confident woman, to a crippled morphine addict is remarkable. Performances by Gerard Depardieu as her manager and Sylvie Testud as her close friend possibly lover, are strong. The singing and concert scenes are marvelous and even though I later found out they were dubbed, it never crossed my mind while watching the film. The acid test was that even though I struggle with understanding French and couldn’t comprehend a lot of the language, I still got everything that was going on and I didn’t feel I missed anything. La Mome is one of those films that when you leave the theater, your molecules have been changed. A MUST SEE RIGHT NOW film. In theaters now in France. is 175 euros (for up to 4 people) and the price will be 150 euros. To receive the discount, please email by clicking the email tab on theleft side above the Google ads and I will send you instructions. Oh, so that's what happened to me when I saw the Edith Piaf film? My molecules changed...that explains it. 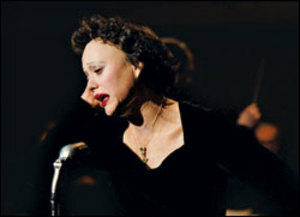 Seriously, something happens to you when you're exposed to the marvelous Piaf and her music. Truly, she has such an immense effect on me and I can't go a day without her music. Molecules, madness, must be something!